The Anti-lock Braking System (ABS) relies upon information coming in from the sensors fitted to the hub assemblies. If under heavy braking the ABS Electronic Control Module (ECM) looses a signal from one of the road wheels, it assumes that the wheel has locked and releases that brake momentarily until it sees the signal return. It is therefore imperative that the sensors are capable of providing a signal to the ABS ECM. 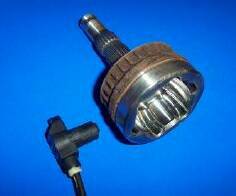 The operation of an ABS sensor is not unlike that of a crank angle sensor, using a small pick-up that is affected by the movement of a phonic wheel, moving in close proximity. The relationship between the phonic wheel and the sensor result in the production of a continuous Alternating Current (AC) sine wave. 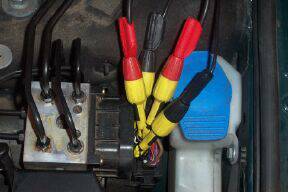 ABS has been a common safety related fitment to vehicles since the early 1980's with systems from ATE, Bosch and Bendix. The systems all have a similar operational strategy and are all electro-mechanical based. The ABS ECM (Electronic Control Module) is wanting to see a continuous stream of sine waves for all four of the vehicle's wheels. If however the brakes are applied and a wheel 'locks', the ECM will loose the signal from the skidding wheel. If the ECM sees this happen, it will immediately release the hydraulic pressure to the wheel in question and very quickly 'pulse' the pressure within the hydraulic system allowing the braking efficiency to be maximised. A vehicle fitted with an ABS system will have improved braking abilities in adverse wet or slippery conditions. Some vehicles may only have ABS fitted to the front wheels of the vehicle. The ABS sensors can also perform another role when the vehicle is fitted with traction control, instead of looking for a loss of signal from a 'locked' wheel the traction control ECM will be looking at the frequencies of the signals to see if any of the wheels are spinning. If a spinning wheel is detected, the engine's power output is reduced until such time as all frequencies from the ABS sensors are the same and traction is regained. Some systems will momentarily apply the brake to the spinning wheel to aid traction on the other wheel. This is a typical front hub ABS set up, whereby the driveshaft has a series of teeth on it and the speed sensor is mounted in close proximity to them. An alternative set up is shown here utilising a castellated drive ring mounted onto the wheel bearing. The inductive sensor is the built into a hub cap located on the inside of the vehicle's hub assembly.